Visit any of the blogs listed below, or use the #Choctoberfest hashtag on Instagram, Twitter, and Facebook to follow along. You can also check out our #Choctoberfest Pinterest board, for chocolate recipes all year long. a Rafflecopter giveaway Stay tuned to see what delicious recipes bloggers have cooked up using Imperial Sugar and Barlean's products. Thank you also to Davis Chocolate and Rodelle for being #Choctoberfest shoutout sponsors! Watch Instagram and Facebook to find out more about about their chocolate products. I've made this smoothie pretty regularly since getting the recipe, and the #Choctoberfest sponsor, Barlean's, gave me some great ingredients to include while giving you guys the recipes. Since Ginger is a bodybuilder from way back, the original recipe included chocolate-flavored protein powder. One of the items Barlean's included in their sponsorship package was a canister of Chocolate Silk Greens, which is a protein powder-like thing full of fruit and veggie antioxidants. They recommend it either hot or cold (cold in this case! ), and there's no added sugar, which is perfect for a low-carb recipe. 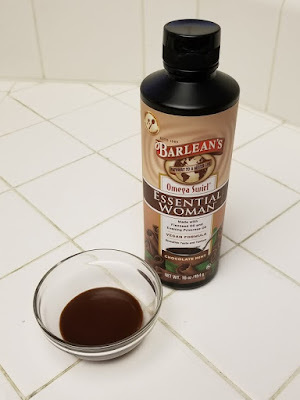 The original recipe only had 4 ingredients, but in the package Barlean's sent me, I found another item that I thought would be an interesting addition to this smoothie: the Essential Woman Omega Swirl in Mint Chocolate. 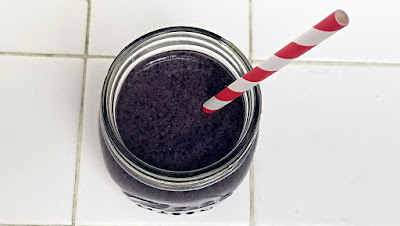 It includes emulsified flax oil that fits in great with the texture of a smoothie, and the chocolate mint flavor comes from all-natural ingredients. This stuff can be used in smoothies like this one, in yogurt, in oatmeal, or even on ice cream. I'll tell you honestly (and I'm always honest, even in #sponsoredposts), that when I took the first sip of this with the addition of the Omega Swirl, I wasn't convinced that mint went along with blueberries and chocolate, but as I continued drinking it, I decided it was a good plan. If you don't have the stuff, though, it's OK. You'll still make an awesome smoothie! Make sure to check out the bloggers listed above for #Choctoberfest, and I hope you'll be back for the recipes I'll be posting the rest of the week, Tuesday through Friday! Add blueberries, nut butter, powder, and Omega Swirl (if using) to a blender or blender cup. 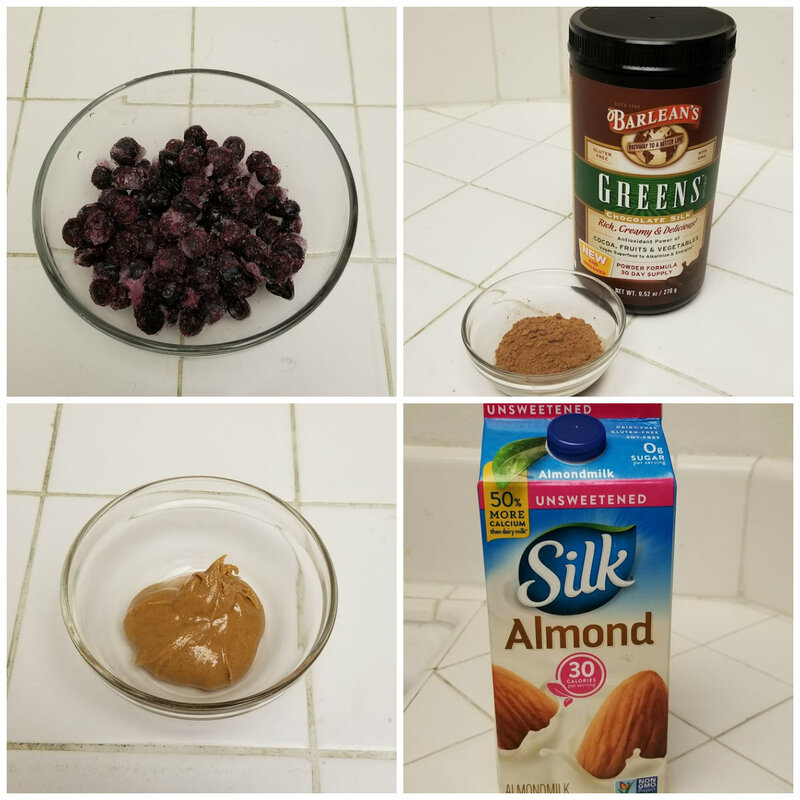 Cover ingredients with almond milk. 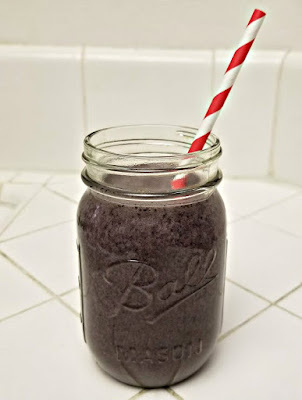 Blend ingredients until smoothie reaches desired consistency. Add more almond milk if the mixture is too thick. Enjoy as a low-carb breakfast!